Arrow enters its usual first-quarter holding pattern in this episode, so we don't make much progress. But "The Magician" is still peppered with great moments. Let's talk about the scenes that absolutely made the episode. Things get worse when Nyssa learns that Quentin hasn't been told about Sara's death. During the episode, they have to go to him for information, and the furious eyeballing between the two women in that scene is scorching! But Nyssa plays along, reluctantly. 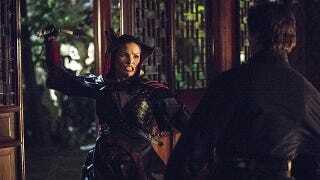 It's when Merlyn gets fingered as Sara's assassin that Laurel's desire for vengeance begins to impress Nyssa. Ollie is clearly not willing to kill Merlyn, so the two form a kind of sorority of blood which continues even after Merlyn seems cleared of the crime. Nyssa approves of Laurel's training at a boxing club, and, with one look at Katie Cassidy's arm muscles, so do I! Good for you, lady! Merlyn does a lot in this episode. He gives Ollie the slip multiple times. He plays Thea and Ollie off each other, as they both inexplicably lie to each other about their secret lives. He engages in an awesome three-way fight with Ollie and Nyssa. He even plays some mind games. When he pins Nyssa with arrows during the fight, he yells that it would be stupid of him to incite the wrath of the League of Assassins by killing the beloved of the Demon's daughter. Then he points fingers. He remarks that Ra's al Ghul is the most ruthless man in the world, and that he might have had a hand in killing, "the degenerate who stole his daughter's heart." I hate to say it, because as you all know Merlyn's brilliant white teeth illuminate my dreams and I see his eyes in the sky every morning, but that was weak sauce! Come on, Merlyn. You wouldn't incur the wrath of the League of Assassins? Why? Are they gonna kill you more than they were before? And Ra's is an immortal warrior who runs an international, ancient order of a assassins. It's pretty naive to think he'd be shocked by a little homosexuality. But the best thing Merlyn did? The absolute best? Was set off a smoke bomb in a temple and disappear into the night. It was the purest, most distilled trope of superhero stories. My god, I've been waiting for a scene like that all my life. That's not as much of an insult as it sounds. I haven't mentioned Roy much so far because he's been fine. He came forward with the information about Thea. He met Thea in Corto Maltese and declared that if she's happier without him, he'll leave her. He fights pretty well when the team's together. He's okay with a platonic relationship with Thea, and with being her re-opened club's assistant manager. He's causing no problems, and having very few, so in a show that's all about problems, he's useless to the narrative. In this episode, he takes the uselessness up a notch. Nyssa kidnapped Thea to draw Merlyn into that three-way fight. Assigned to guard Thea, Roy saw Nyssa coming, executed one flip, took a dart to the neck, and collapsed. That made me giggle until I inhaled Nutella. In fact, the scene kind of makes it look like Thea let herself get taken because Roy was with her. I loved how every single character in the show looked at a plume of purple smoke and realized it meant, "Merlyn, I have kidnapped your secret daughter." They're good. I would have interpreted that as, "There's a new Pope, and the Vatican's loosening up a little." In the end, Ollie not only doesn't execute Merlyn, but says the League of Assassins can't either. Supposedly he does this to make sure that no one eliminates evidence which could lead to Sara's real killer. Nyssa goes back to what appears to be Westeros to report this. Ra's takes this in, and says that Oliver Queen "courts war with us." This could be interesting. But while Nyssa is reporting to him, and while he's considering the information, he appears to be in the bath. I know it's a reference to the Lazarus pit, but there are tons of people in that room! Is that what warlords do? Take a bath in front of an audience? If they made this public, there would be fewer warlords in the world. Many of you guessed that Amanda Waller was the mysterious person who ordered Eddie Fyers to shoot down an airliner. Yep, you were right! She did this to kill one ex-ARGUS agent. Chien Na Wei, if you remember, became a mid-level criminal and was captured by Ollie at the beginning of the second season. So that was clearly worth an airliner worth of innocent people. Fortunately Waller was thwarted by three people on an island. She would have gotten away with the attempt, too, if she hadn't ordered one of those three people - Ollie - to kill Fyer's handler. It was only when he assassinated the guy that he found the data. Amanda Waller: the villain whose immorality is only checked by her incompetence.